In recognition of outstanding service to physics, and thereby exemplifying the mission statement of Sigma Pi Sigma, William DeGraffenreid is hereby awarded the Sigma Pi Sigma Outstanding Service Award. Dr. William DeGraffenreid joined the Sacramento State faculty in 2002 and is currently a Professor and Chair in the Department of Physics and Astronomy. Dr. DeGraffenreid earned his Ph.D. in Chemical Physics from the University of Maryland and his B.S. in physics from California State Polytechnic University, Pomona. 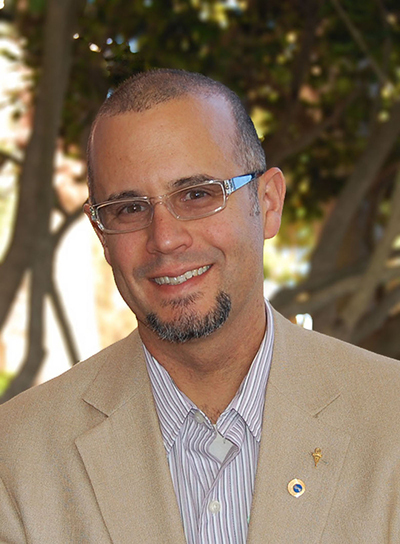 Before joining Sacramento State, Dr. DeGraffenreid was a National Research Council Fellow at the National Institute of Standards and Technology in Maryland. Since arriving at Sacramento State, he has been active in the area of scientific instrumentation; an area that has allowed him to work with faculty members in many departments on campus. He has won the University’s Outstanding Teaching, Outstanding University Service Awards, and Outstanding Community Service Award. Dr. DeGraffenreid has been highly involved in the Society of Physics Students and Sigma Pi Sigma since his first SPS meeting at Cal Poly Pomona in the fall of 1991. As a student member, he served as Treasurer, Vice President, and Treasurer. He was inducted into Sigma Pi Sigma in 1993. He served on the SPS National Council for six years (2003 – 2009), as President of Sigma Pi Sigma (2012 – 14), and as Chair of the Congress Planning Committee (2012 – 2016).